This galvanized horse stall corner feeder will not corrode or rust. It has smooth, round edges for safety during feeding time and has a built-in tray for feed with a closed in back, so hay will not fall out. Only 2 remaining! Designed to provide a durable and efficient means of feeding both hay and grain from the same feeder. This galvanized horse stall corner feeder will not corrode or rust and has all smooth, round edges for your horse's safety while it is feeding time. 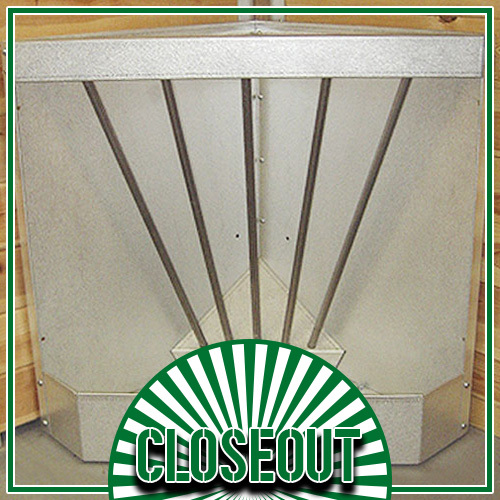 The corner feeder has a built-in tray for feed and a closed in back so hay will not fall out of it. All feeders have an enclosed back to prevent hay from falling out. *Note: This feeder does not come pre-assembled.